Not everyone in America is hurting during this economic downturn. In fact, the wealthiest Americans are doing just fine. At a time when millions of Americans are losing their jobs and their homes, the folks at the top end of the income scale are actually seeing their incomes go up. In 2009, the number of millionaires in the United States rose 16 per cent to 7.8 million at a time when tens of millions of other Americans were experiencing gut-wrenching economic despair. The truth is that the statistics and the data do not lie. Wealth and income are increasingly becoming concentrated in the hands of the wealthiest Americans. So just what in the world is going on? Well, the reality is that the game is rigged to take wealth away from middle class and working class Americans and to give it to the elite. There is a reason why they push credit cards on you so hard. That $6000 balance that you keep carrying will end up costing you over $30,000 to pay off if you are not careful. We were told that owning a home was “the American Dream” and yet predatory mortgages have destroyed the financial lives of millions of Americans. The majority of Americans now live “month to month” and barely save any money at all. In fact, Americans are programmed to be slaves of the system. We are taught that we need to go get a job (“just over broke”) and work ourselves silly all day, and then at night we are taught to collapse in front of the television where we are bombarded with messages telling us to be good consumers and to go out and get into even more debt so that we will have to endlessly work to pay it off. Today more wealth is in the hands of the wealthiest Americans than at any other time in modern U.S. history. An analysis of income-tax data by the Congressional Budget Office a couple of years ago found that the top 1% of households own nearly twice as much of the corporate wealth in the United States as they did just 15 years ago. 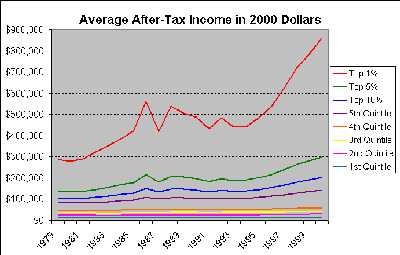 While the average income for the poorest Americans has barely grown over the past several decades, the incomes of the wealthiest Americans have absolutely exploded as the following chart demonstrates…. So why is this happening? Well, automation and “offshoring” are typically offered as two key reasons. Millions of hard working American manufacturing workers have been replaced by robots and by outsourcing, and this has enabled many very wealthy Americans to get even more wealthy. But these reasons alone do not explain the increasing disparities. The truth is that over the past couple of decades, the “rules of the game” have been tilted even more in favour of the rich. 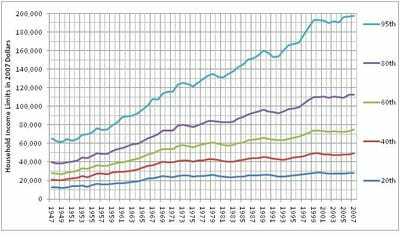 Centralization and globalization have been two keys trend which have contributed to this. For example, in the old days you could make a good living by opening up a store in your local town if you worked really, really hard. But today you will be crushed by Wal-Mart and other “big box” stores. So where do all the big profits that Wal-Mart and the other “big box” stores make go? They get shipped out of your community to a bunch of rich fat cats. But apologists for the current system will cry that Wal-Mart and the other “big box” stores create jobs. Well, yeah, if you like to work for minimum wage. Have you tried to support a family on minimum wage? The entire economy is becoming completely dominated by giant global corporations. These giant corporations are more than happy to put American consumers into debt by selling them substandard junk manufactured in China, India and Mexico. And it is a great time to be wealthy – especially if you are at the very top. For example, New York state Comptroller Thomas DiNapoli recently announced that Wall Street bonuses for 2009 were up 17 per cent when compared with 2008. 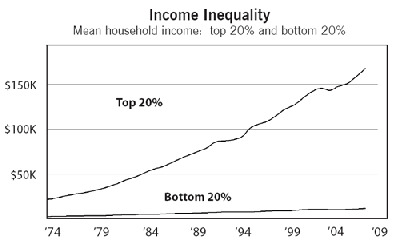 In fact, incomes for the top 1% of wage earners in the U.S. are shooting into the stratosphere as you can see from the following chart…. Unfortunately, all of this globalization, centralization and greed is fundamentally changing society. 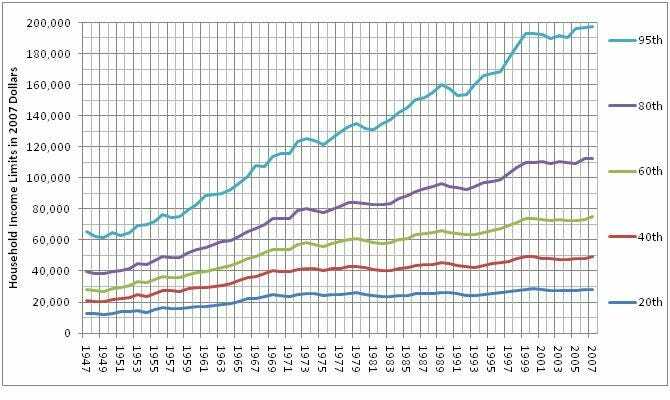 The gap between the rich and the poor is growing at an exponential rate. 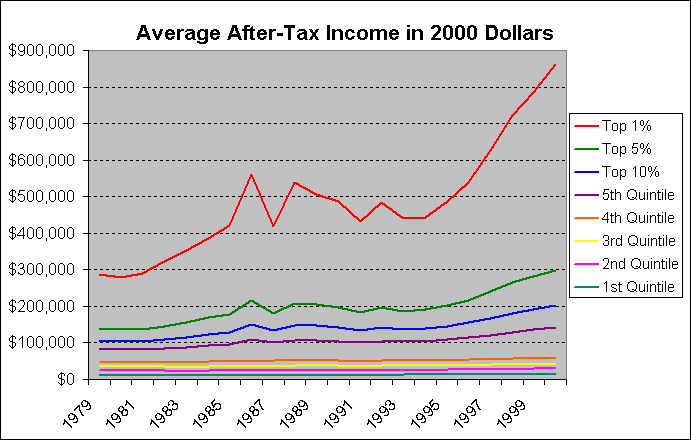 Is it a good thing for a society to have this kind of income inequality?…. Even the current economic collapse is hitting the poor much harder than the rich. Take a moment to examine the chart below. 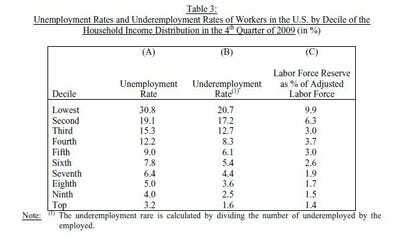 The 10 per cent of Americans that have the lowest household incomes have an unemployment rate of over 30 per cent, while the 10 per cent of Americans that have the highest household incomes have an unemployment rate of just about 3 per cent…. And if the wealthy do get into trouble what happens? Well, they get government bailouts of course. The U.S. government is more than happy to rush in with billions (and even trillions) of dollars at the drop of a hat when their friends on Wall Street are in trouble. But if you get into trouble do you think the U.S. government is going to bail you out? No, the truth is that millions upon millions of Americans are losing their jobs and their homes and the U.S. government seems perfectly fine with that. We live in a society where individual Americans find themselves with a rapidly diminishing share of the power. Instead, power is concentrated in the hands of massive international corporations and elite power brokers who are more than happy to use globalization to crush anyone who gets in their way. After all, how can a hard working American compete with someone willing to do the same job for $1.25 an hour in another country? We have allowed the U.S. economy to become globalized, and so now those who are dependent on a job will increasingly find themselves competing for wages in a global marketplace. Can someone in China or India do your job? You better hope not, because there are people there who would be more than happy to do it for a fraction of what you make. 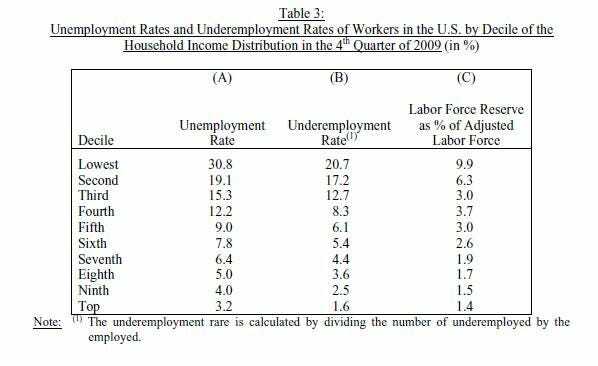 As labour continues to become seen as a globalized commodity, the power and earning ability of the average American worker will continue to decline. 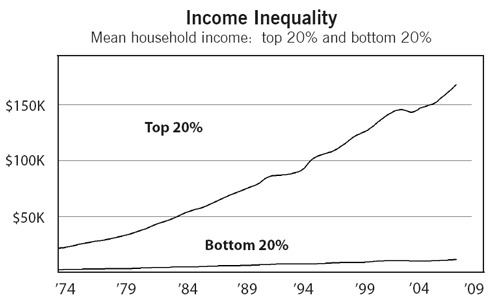 The gap between the rich and the poor will continue to expand. The giant international corporations and the elite power brokers of the world will continue to win and the rest of us will continue to lose. Meanwhile, the vast middle class that once made the United States the envy of the world will continue to rapidly disappear. But instead of doing something to fix the problems, one big group of Americans want to cheer on the wealthy as they plunder the rest of us and another big group of Americans just wants to give everyone a handout. Wouldn’t it be great if someone actually decided to fix the great economic machine that produced the biggest middle class in the history of the world? Unfortunately, that is not likely to happen. The truth is that the U.S. economy is basically impossible to fix at this point – but that is the subject for another article.